The Kohen shall make one as a sin-offering and one as an elevation-offering, and he shall bring atonement on him for having sinned against the person; and he shall sanctify his head on that day. T he nazir who vows not to drink wine is elevated to a level of holiness similar to that of the Kohen Gadol. Like the Kohen Gadol, he is prohibited from defiling himself for the dead, even his closest relatives, and the Torah describes his hair, which he must let grow, as sanctified. Yet this very same nazir must bring a korban chatas - a sin offering - at the termination of his vow. The Gemara explains that this sacrifice is to atone for the sin of denying himself the pleasure of wine. Thus the same vow which elevates him to a level of holiness also causes him to be adjudged a sinner. Why? "All that the Holy One, Blessed is He, created in His world, He created solely for His glory" (Pirkei Avos 6:11). Hashem created the world for man to utilize in His service, not to be retreated from. Every aspect of creation can and must be utilized to aid one in understanding and drawing closer to its Creator. 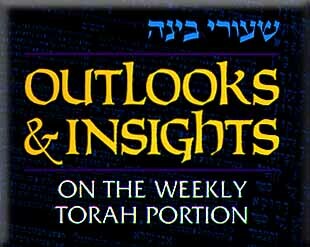 The Torah outlook on the physical world is diametrically opposed to the Christian viewpoint. Christianity teaches that the material world is inherently evil. Any enjoyment of the pleasures of the physical world is permissible only as the lesser of two evils. The only sacrifice a gentile may bring is an olah, which is wholly consumed. The only kedusha (holiness) understood by the nations of the world is total negation of the material world. By contrast, our most exalted sacrifice is the shelamim (literally a perfect, harmonious offering) where only a small portion of the offering is burnt on the altar. Most of the offering is eaten by the one who brought the sacrifice and the Kohen who offered it. My Rosh Yeshiva, Rabbi Mordechai explains the verse, "Be holy, for I, the Lord your God am holy" (Vayikra 19:2), to mean that just as Hashem is intimately involved in every aspect of the physical world - since only His will at every moment allows anything to exist - so, too, must we have contact with the entire physical world. But our involvement must imitate Hashem’s: we must elevate and sanctify the physical, and not let the physical drag us into materialism devoid of spirituality. In the World to Come, we will be taken to task for everything in this world we could have enjoyed and elevated but did not. Every year we make a beracha over the blooming fruit trees to remind ourselves that Hashem created good and beneficial creations for man’s enjoyment. The wine forbidden to the nazir can enhance our performance of various mitzvos and occasions of joy by helping us give expression to our innermost sentiments. When detached, however, from mitzvos and utilized as an end in itself, it degrades a person by robbing him of his most precious possession, his mind. Thus one who "sees a sotah in her disgrace," i.e., brought to shame from an abuse of wine, and who recognizes a similar weakness in himself, should vow to abstain from wine for a period of time to control his weakness. Recognizing one’s weakness and choosing abstinence over abuse renders one holy. But lest the nazir lose sight of the ideal, the Torah reminds him that he is nevertheless a sinner. He has not yet achieved the goal of life of elevating the entire physical world. Were he on the ideal level, he would not have to abstain from wine, but would instead utilize it for spiritual growth. Thus the same vow that renders him holy is also a compromise of the true ideal. In this context, we can better understand the requirement that the nazir let his hair grow wild. The hair corresponds to the spiritual connections that link a person to his spiritual essence above. When the hair is in order, the physical and spiritual worlds mesh. Both the king and the Kohanim are required to cut their hair regularly as a sign of the orderly bond to the spiritual world that is necessary to properly fill their exalted positions of authority. A nazir must let his hair grow wild to signify the short-circuit that necessitates his temperance. At the conclusion of his lesson in self control, he shaves his hair to signify a new beginning, a total reorganization and rewiring of his physical-spiritual bonds. The hair is then burnt under the pot in which his shelamim offering is cooked to signify this new found harmony. In this context the Torah states, "and after [this process] the nazir can drink wine" (Bamidbar 6:20). This verse is problematic, since after the process is finished he is no longer a nazir. The Torah is telling us that the purpose of his nezirus was not abstinence for its own sake, but rather as a lesson in how to properly drink wine after the period is over. Hence the goal of his nezirus is to drink wine as a nazir, as one sanctified and uplifted. Reprinted with permission from Artscroll Mesorah Publications, ltd.